What Can Downton Abbey Teach Us About Organizational Culture? Like social culture, organizational culture is pervasive. It’s also one of the most important factors in our ability to sustain innovation. This is the third installment in the Cleveland Chronicles, Corey Atkins’ reflections on his experiences with Cleveland Play House in the EmcArts Engaging the Future program. You’d be surprised what a non-profit organization can learn from the for-profit, upper-class family living at Downton Abbey. Many of us who (over-)work in non-profits can probably relate to the inimitable Dowager Countess of Grantham’s query, “What is a week-end?” But it was actually exploring the source of these bon mot, delivered to such effect by Maggie Smith, that illuminated the core concept of the most recent Engaging the Future workshop: changing and adapting organizational culture. 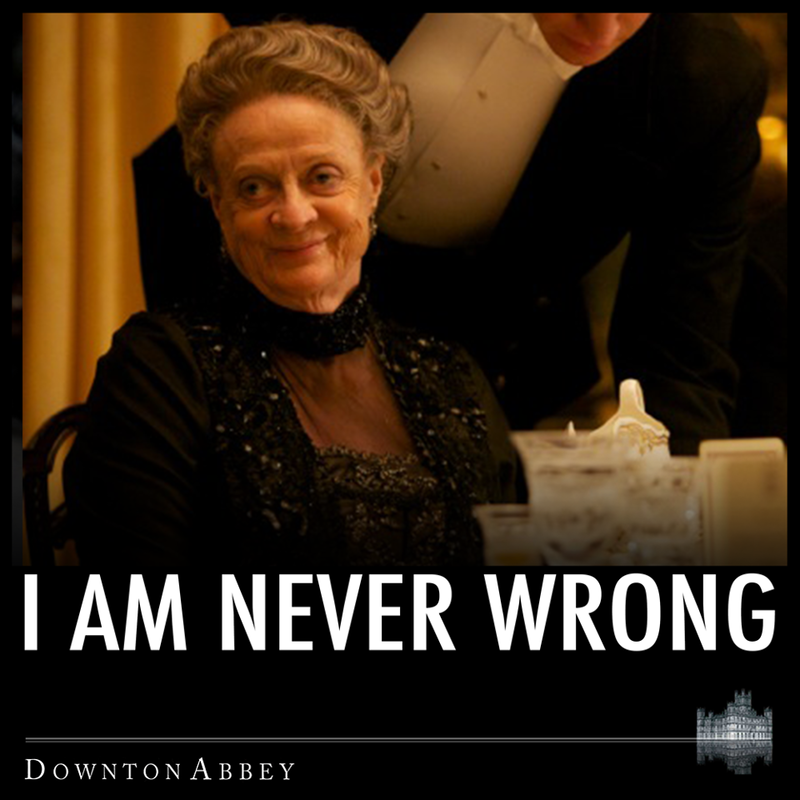 At the risk of killing humor by analyzing it, let’s look at one of the Dowager’s most meme-inspiring scenes. When Lord Grantham can’t find an evening-dress shirt he’s forced to go down to dinner “improperly dressed” in black tie. The Dowager asks him to bring her a drink, then, realizing she’s addressing her son, offers this serious-as-a-heart-attack apology: “Oh, I’m so sorry. I thought you were a waiter.” It’s funny because the character is completely immersed in her own outrageously singular perspective of the world. But think how frequently the daily function of our organizations is governed by an organizational culture run on equally outrageous assumptions about “the way we do things around here.” Like social culture, organizational culture is largely subterranean, and equally pervasive. It’s also the single most important factor in our ability to continue innovation, embrace inevitable change, and, ultimately, rally others to our side. And, unlike the Dowager, the results of our assumptions are generally not funny. When an assumption is all around us, it can quickly morph into an organizational “fact.” These assumed “facts,” in turn, influence our actions. And those actions say more about our organizations’ actual values than any mission statement. Edgar Schein, former MIT professor and expert in organizational development, asserts that there are three levels of organizational culture: typical behaviors, stated values, and fundamental assumptions. (You can learn more about these three levels in a recent ArtsFwd Tipster post.) Examining what we say (stated values) versus what we do (typical behaviors) can be very telling. In examining where Cleveland Play House is in its evolution, we realized—as did many of our fellow ETF-ers—that we’ve written down lots of great goals and aspirations, but we’re nowhere near owning our stated values like we want to. An organization’s strategies are generally in line with its culture. If we can identify what our organizational culture actually is, we can make it work for us—or at least work to make it work! 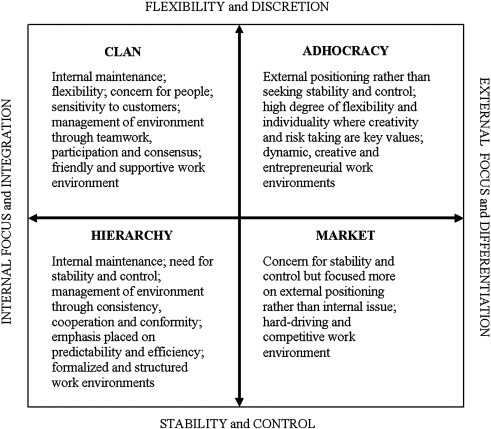 Kim Cameron and Robert Quinn have identified a quadrant system with four culture types— Clan, Adhocracy, Hierarchy, and Market—as a way for organizations to actually graph where they are, where they’d like to be, and decide how to get there. Of course, no organization is completely in any single quadrant; we might ideally possess equal measures of each. All organizations possess a range of processes and beliefs, and the sum total of these make up our overriding organizational culture. It’s in overriding our old overriding culture that we activate change. To finish the workshop, we assigned values to various aspects of Cleveland Play House’s organizational culture as expressed in our actions, and then created our own graph image of our current organizational balance. We were only mildly surprised to find that, rather than an equilateral square nicely centered among the quadrants, our organizational image was more kite-shaped, its longer end extending into Market. This indicates a prevailing concern for the bottom line. The major adaptive change we’ve undergone in the last three or four years is a direct reaction to our near-extinction just a few years ago. Now that we’re both artistically and financially successful, the fear of returning to our former troubles can make risk-taking feel all the riskier. But when we created a second graph—our desired balance—we found that we’d like to have more stake in every quadrant but Market. The shift made our image a more traditional square, but with a notably extended point reaching into Adhocracy—a desire for Cleveland Play House to be an innovator and field leader in the long-term. We already have many unique and innovative programs and qualities: not just in Engagement (my department), but in Education, and on stage as well. But we also sense that these innovations are currently satellites; many of our flagship innovations live, semi-siloed, in a single department with others only being made aware when their actions bring them into another’s innovative orbit. Discussing this with our Managing Director, Kevin Moore, I got a look at the many shifts in culture that CPH has experienced in our eventful ninth decade. When Kevin came to the organization seven years ago—“the lean times,” he said—we were dealing with common problems in the arts: aging and declining subscriber base, difficulty selling artistically adventurous work, an overall organizational “image problem.” We also had the added burden of an inefficient building shackling our abilities to put either human or financial capital into innovation. We were functioning in a Hierarchy structure, due to the need for efficiency. We’ve now moved out of that territory— but laterally into a Market-oriented structure. This bottom-line focus can make it challenging to feel like there’s a “cushion” to land on if risky attempts at innovation fail. *With apologies for Her Ladyship’s out-of-context classism.